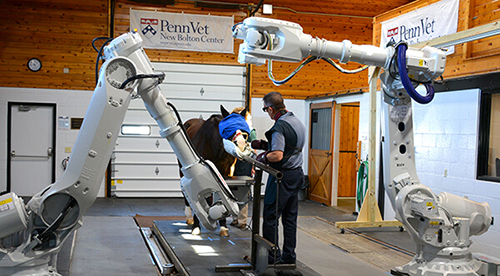 Penn Vet’s New Bolton Center has completed installation of a revolutionary robotics-controlled imaging system for use in the standing and moving horse, and in May will start exploring limited diagnostic imaging on patients. The University of Pennsylvania School of Veterinary Medicine (Penn Vet) is the first veterinary teaching hospital in the world using the EQUIMAGINE™ system, which has clinical and research applications for both animal and human medicine. New Bolton Center veterinarians are developing the application-related protocols for use of the system with large animals, in collaboration with Four Dimensional Digital Imaging (4DDI), the company behind the innovation of the system. ABB, a leading global manufacturer of industrial robots, supplies the robots and many of the control components used in 4DDI systems. Penn Vet experts are working with colleagues at Penn Medicine and Nemours Children’s Health System to identify and develop applications in human medicine. There is great potential, in particular, for the musculoskeletal system such as joints and the spine, cardiovascular interventions, and pediatrics, primarily because of the ability to obtain high-quality images while the patient is in motion. “We think the system is not only beneficial to horses, but also will have translational benefits for people,” said Dr. Barbara Dallap Schaer, Medical Director of New Bolton Center, the large-animal hospital of the University of Pennsylvania School of Veterinary Medicine. The EQUIMAGINE™ imaging system arrived at New Bolton Center in February and has been going through a complex installation process, with a team of experts working on initial application-related tuning and testing for use with a standing horse. The system is capable of capturing the equine anatomy in a way never before possible, while the horse is awake and load-bearing. Existing computed tomography (CT) systems usually require the horse to be anesthetized, and are limited to the parts of the animal that fit into the cylindrical machines. “The robots can easily move all around the horse in any orientation while the horse is standing, so we can see many parts of the anatomy we’ve never seen before, and do it in a patient that is awake,” Dallap Schaer said. The robotics-driven technology unites automation with powerful algorithms that can perform multiple modalities, unencumbered by an enclosed gantry or a C-arm, making it possible to scan any part of the horse. The robot-powered imaging modality can collect typical, two-dimensional CT images; create three-dimensional images; produce 360-degree digital radiographic studies; and capture fluoroscopic images at up to 16,000 frames per second. Tomosynthesis, a modality that produces extremely high-resolution images of a focused area of clinical interest, will be explored in the near future. Eventually, researchers, clinicians, and engineers hope to program the robots to capture images of a horse running on a treadmill. The quality and resolution of the real-time images created with the EQUIMAGINE™ system far exceeds existing technology, experts from Penn Vet and 4DDI say. And the system makes imaging much more efficient and effective. The three-dimensional scans take less than a minute, a fraction of the time it takes to produce multiple static images that have limited diagnostic value. Most specialists at New Bolton Center will be able to take advantage of the technology, including but not limited to those in surgery, sports medicine, neurology, cardiovascular medicine, and internal medicine. “The possibilities are almost unlimited in terms of the conditions that can be addressed with this system,” Dallap Schaer said. Dr. Dean Richardson, Chief of Surgery at New Bolton Center, is providing surgical expertise for the further refinement of the new system, especially with respect to orthopedics. Richardson has vast experience using CT imaging during surgery to treat horses with serious fractures. The images from the new system are much more detailed, Richardson said, and can help to identify not only a fracture, but also its specific characteristics: location, depth, and breadth. He expects the new technology will help prevent injuries, especially in racehorses, by allowing early detection of fractures. The system will be important not only for clinical use in the hospital, but also for research and teaching. Penn Vet researchers and clinicians are in discussions with colleagues at Penn Medicine, Nemours Children’s Health System, and other human medical centers about possible applications of the new imaging system. The ability to obtain high-quality images of a joint in motion, or the spine, or the head, could open up vast possibilities of discovery in the areas of diagnosis, treatment, and medical product development. In pediatric patients, it would allow imaging of a child while awake and moving, rather than under general anesthesia or while restrained. “This technology enables us to push the ‘One Health’ research frontiers in imaging to better understand potential new pathologies that haven’t been detected before,” said Dr. Thomas Schaer, Director of Penn Vet’s Preclinical Service Core & Translation in Orthopedic Surgery, who is leading the translational research efforts. There are great possibilities for teaching, as well. “Three-dimensional imaging is an enormously valuable tool in teaching anatomy, and there is nothing more important in the education of a medical specialist than understanding anatomy,” Richardson said. New Bolton Center was chosen by 4DDI as the beta site because the veterinary experts are willing to collaborate to develop the protocols for use with large animals, said Nicholas Hunt, Chief Technology Officer for 4DDI. “At 4DDI we are excited that New Bolton has chosen EQUIMAGINE™ to develop these new technologies,” said Hunt, who has led the team doing the installation. The horse is probably “the most sophisticated and difficult patient we will ever encounter,” because of the size and complexity of the animal, as well as the need to correct for motion, said Yiorgos Papaioannou, 4DDI Chief Executive Officer. Christos Mitrogiannis, a specialist from 4DDI, will work with New Bolton Center clinicians during the first year to further the application capabilities of the system. In addition, radiologist Dr. Chris Ryan is now on New Bolton Center’s staff as part of the project, dedicated to interpreting the new digital images. “My goal is to help bring this new robotic imaging modality from the research and development phase to every day clinical use,” Ryan said. The acquisition of the system was funded in part by a generous gift from the estate of Mimi Thorington. The purchase includes four robots: the two large units now installed in New Bolton Center’s treadmill building, and two smaller units to be installed near New Bolton Center’s orthopedic surgery suite this year. Additional gifts will help to integrate the new technology into the clinical and research programs at New Bolton Center.